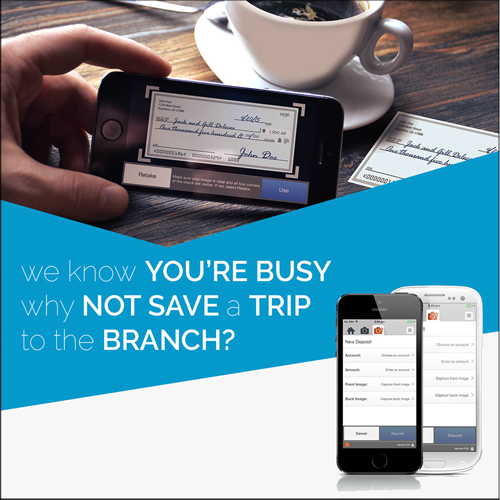 Using the Mobile Deposit feature of our PSB Anywhere mobile banking app on your smart phone, depositing your personal checks has never been easier. Traffic headaches – no problem! Bad weather – no problem! Out of town – no problem! The bank is closed – no problem! Simply log in to PSB Anywhere on your mobile device, select the Deposit option, choose the account into which you would like to deposit your check, enter the amount of the check, snap a picture of the front and back of the check, and submit it for deposit. You can then track the status of the deposit as it moves from Pending to Accepted within the app. We review mobile deposits periodically throughout the work day, so shortly after the deposit status changes to Accepted your account balance is updated, unless availability is delayed in accordance with our Funds Availability policy. Deposits submitted and Accepted by 5p EST Monday through Friday are credited as of that business day, excluding federal holidays or other days that we may be closed. Deposits submitted after those times, on Saturdays, on federal holidays, or on other days that we may be closed, will be reviewed and if Accepted credited as of the next business day. Before logging into the PSB Anywhere mobile app, close all other apps running in the background on your mobile phone. Flatten folded or crumpled checks before taking a picture of the front and back of the check. Take the photos of your check in a well-lit area, placing the check on a solid dark background to increase contrast and reduce any reflection. Keep your smart phone parallel to the surface of the check, remain steady when taking your photos, and keep the check squarely in the view finder to reduce corner to corner skew. Try not to get too much area surrounding the check in order to maximize the image size. Ensure the entire check image is visible and in focus before submitting your deposit, including all four corners. If necessary, delete the image and take another photo. For further information about our PSB Anywhere mobile app and downloading instructions, please see our PSB Anywhere Mobile Banking Page.